A few months ago Bijou Basin Ranch offered me the opportunity to try their Gobi Yarn yarn. Bijou Basin Ranch is a working ranch in western Colorado that produces high quality, luxury fibers. They have a whole herd of Tibetan yaks (including Ruby who is often featured on their Instagram account) and I haven’t met a yarn from them that I don’t love. They also team up with various dyers to create limited runs of special colors. 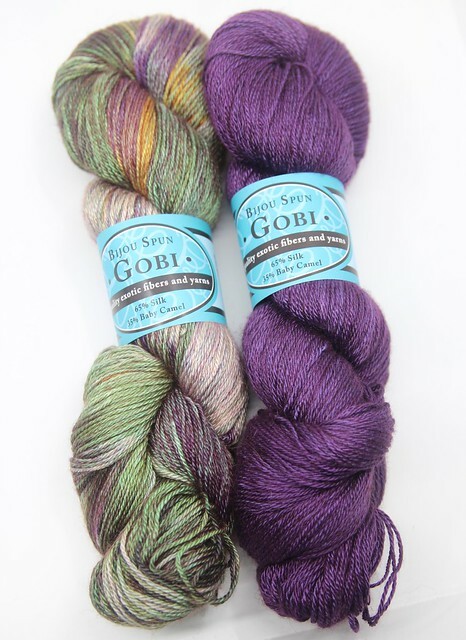 Gobi is a 35% baby camel and 65% mulberry silk blend, and comes in 3.45oz/100g skeins of 435 yards of luscious yarn. I selected the colorways Eir and Asgaard which were custom dyed by MJ Yarns. 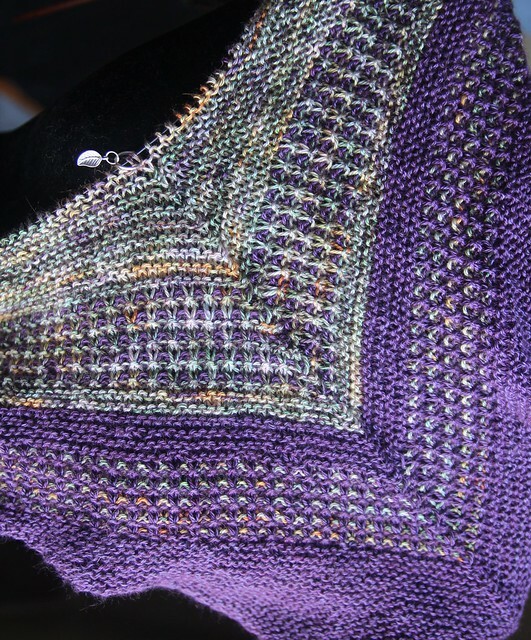 I decided that I wanted to knit a 2-color shawl and given recent discussions in the knitting community, I knew I wanted to find a design by a designer of color. 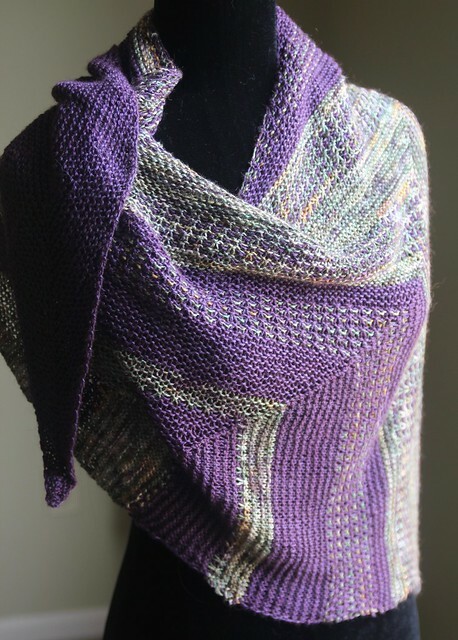 I perused lots of great designers (if you’re looking for a list to start from try Jeanette Sloan’s list here) and decided to knit The Drifter by Tamy Gore. The Drifter can be knit with multiple mini-skeins but I opted to knit the 2-color version. 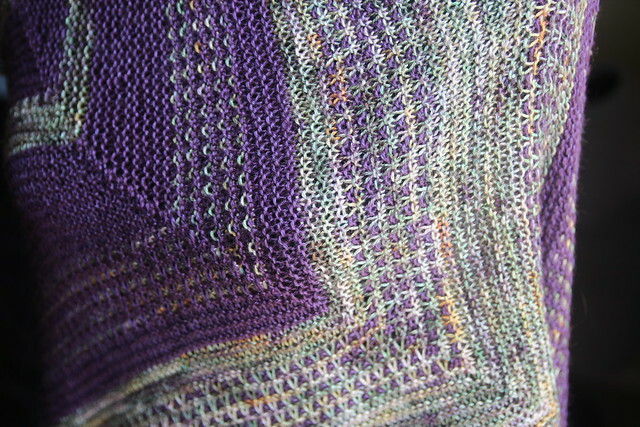 The shawl is composed of sections of garter stitch alternating with sections of a textured stitch. At first I wasn’t sure that the colors I had chosen were adding enough contrast, but once I saw how it read on camera I knew I had made the right choice. 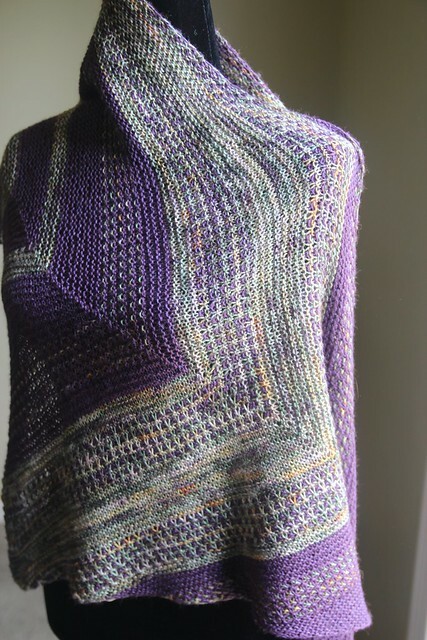 The variegated color is sort of out of my normal range, but I LOVE how it plays with the purple. The yarn itself is soft and silky and super luxurious. It was a little bit splitty, but stood up to my ripping back when I needed to. Once blocked, it is SO drapey and silky. I think this one is going to my mom for Mother’s Day and I couldn’t be more pleased with the finished shawl. A special thank you to the Bijou Basin Ranch who sent me 2 skeins of Gobi (retail: $60.00) for free. I received no other compensation for this review. All opinions and photos are my own. This is so beautiful! Love the combo. Previous Episode 222: Almost Spring! Next Episode 223: Spring MAL!